Cocktails are back! Craft cocktails are becoming the norm in restaurants all over the country, and Hilton Head Island is starting to see them pop up in restaurants all over town. For the last 10 years “craft bars” have been opening around the country, focused on classic cocktails and new rifts on the old school drinks. Over the last few years, the craft cocktail culture has permeated its way into everyday restaurants. 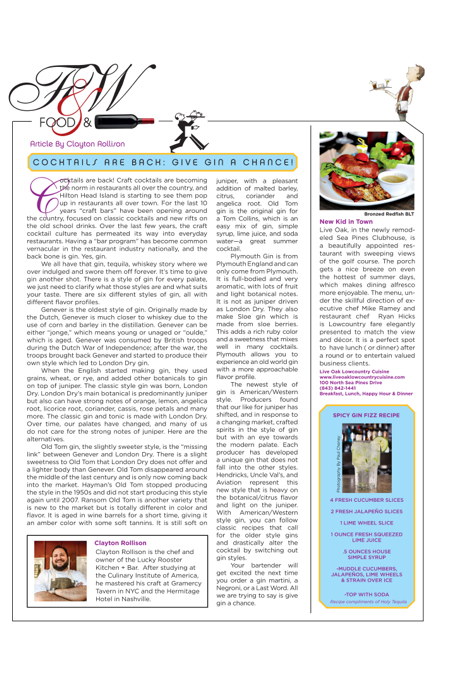 Having a “bar program” has become common vernacular in the restaurant industry nationally, and the back bone is gin. Yes, gin. We all have that gin, tequila, whiskey story where we over indulged and swore them off forever. It’s time to give gin another shot. There is a style of gin for every palate, we just need to clarify what those styles are and what suits your taste. There are six different styles of gin, all with different flavor profiles. Genever is the oldest style of gin. Originally made by the Dutch, Genever is much closer to whiskey due to the use of corn and barley in the distillation. Genever can be either “jonge,” which means young or unaged or “oulde,” which is aged. Genever was consumed by British troops during the Dutch War of Independence; after the war, the troops brought back Genever and started to produce their own style which led to London Dry gin. When the English started making gin, they used grains, wheat, or rye, and added other botanicals to gin on top of juniper. The classic style gin was born, London Dry. London Dry’s main botanical is predominantly juniper but also can have strong notes of orange, lemon, angelica root, licorice root, coriander, cassis, rose petals and many more. 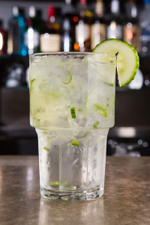 The classic gin and tonic is made with London Dry. Over time, our palates have changed, and many of us do not care for the strong notes of juniper. Here are the alternatives. Old Tom gin, the slightly sweeter style, is the “missing link” between Genever and London Dry. There is a slight sweetness to Old Tom that London Dry does not offer and a lighter body than Genever. Old Tom disappeared around the middle of the last century and is only now coming back into the market. Hayman’s Old Tom stopped producing the style in the 1950s and did not start producing this style again until 2007. Ransom Old Tom is another variety that is new to the market but is totally different in color and flavor. It is aged in wine barrels for a short time, giving it an amber color with some soft tannins. It is still soft on juniper, with a pleasant addition of malted barley, citrus, coriander and angelica root. Old Tom gin is the original gin for a Tom Collins, which is an easy mix of gin, simple syrup, lime juice, and soda water—a great summer cocktail. Plymouth Gin is from Plymouth England and can only come from Plymouth. It is full-bodied and very aromatic, with lots of fruit and light botanical notes. It is not as juniper driven as London Dry. They also make Sloe gin which is made from sloe berries. This adds a rich ruby color and a sweetness that mixes well in many cocktails. Plymouth allows you to experience an old world gin with a more approachable flavor profile. The newest style of gin is American/Western style. Producers found that our like for juniper has shifted, and in response to a changing market, crafted spirits in the style of gin but with an eye towards the modern palate. Each producer has developed a unique gin that does not fall into the other styles. Hendricks, Uncle Val’s, and Aviation represent this new style that is heavy on the botanical/citrus flavor and light on the juniper. With American/Western style gin, you can follow classic recipes that call for the older style gins and drastically alter the cocktail by switching out gin styles. Your bartender will get excited the next time you order a gin martini, a Negroni, or a Last Word. All we are trying to say is give gin a chance. 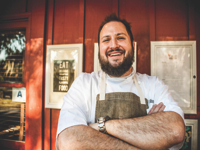 Clayton Rollison is the chef and owner of the Lucky Rooster Kitchen + Bar. After studying at the Culinary Institute of America, he mastered his craft at Gramercy Tavern in NYC and the Hermitage Hotel in Nashville. Live Oak, in the newly remodeled Sea Pines Clubhouse, is a beautifully appointed restaurant with sweeping views of the golf course. The porch gets a nice breeze on even the hottest of summer days, which makes dining alfresco more enjoyable. The menu, under the skillful direction of executive chef Mike Ramey and restaurant chef Ryan Hicks is Lowcountry fare elegantly presented to match the view and décor. It is a perfect spot to have lunch ( or dinner) after a round or to entertain valued business clients.